I have not seen the DVD from which this present CD is the audio soundtrack, so I cannot pass comment on its effectiveness or otherwise. As I understand it, the film sought to prove that ‘simply listening to these pieces offers only partial access to them.’ The blurb for the DVD suggests that ‘this superb film is not only the record of brilliant performances of major modern quartets and fine entertainment, it is also a valuable and rewarding tool for observing how the players of an ensemble communicate and interact, especially in works like that of Lutoslawski which allow performers a degree of choice. Above all it is a demonstration that music very often should be seen as well as heard.’ It is certainly an interesting concept, bearing in mind that today most music is probably heard in media where ‘the sound has been separated from the means of production’: radio, MP3s, CDs etc. The recital opens with Igor Stravinsky’s Three Pieces for string quartet completed in 1914. They were dedicated to the great Swiss conductor Ernest Ansermet. The opening movement is brief and based on a four-note motif. It is followed by the ‘eccentric’ middle movement inspired by the English music hall comedian ‘Little Tich.’ The finale is largely chordal and explores the effect of ‘sul tasto’ – above the fingerboard, which robs the sound of its acoustic richness. Stravinsky ‘modestly’ felt that this was some of the best music written (by anyone) to date! George Dyson wrote in his book The New Music (1924) that ‘if this type of passage - in the second movement - has any proper place in the art of the string quartet, then the end is near.’ The three movements are entitled Danse, Excentrique and Cantique: these were added when the work was orchestrated in 1928. I have not heard Witold Lutoslawski’s String Quartet (1964) before. This modernist work was originally intended to be presented to the soloists as a set of parts with no cues – that is aids to help the players orientate themselves with each other. It was not to be. The LaSalle Quartet insisted on a ‘score’ which was duly prepared by the composer’s wife, Danuta. The quartet is partly aleatory in concept, that is where details of the performance, sometimes including notes, part entries and rhythm, are left up to the players. In Lutoslawski’s case this idea of chance is controlled to a certain extent. I think that what the composer has done is to create a work for four individualists who most often seem to do their own thing, but on occasion come together. The Quartet is in two sections, an Introduction and the Main Movement which run together without a break. Whatever the technical construction of this Quartet, it sounds striking, is often exciting, and just occasionally has moments of sheer lyricism. One wonders to what extent the impact of the work is dependent on the musical preferences of each soloist: I think a lot. Furthermore, I understand that much of the effect of this performance is lost by not being able to see the performers interact. 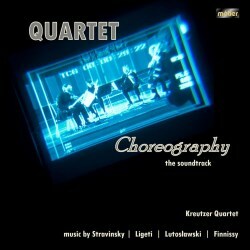 My favourite work on this CD is György Ligeti’s Second String Quartet, dating from 1968. Once again this work was composed for the LaSalle Quartet, who gave the premiere in December 1969. The five-movement structure has been likened to that of Bartok, however, Ligeti uses his material in his own inimitable manner. The concept seems to be a vivid juxtaposition of a variety of string quartet textures and a huge range of dynamic gestures. The watchword is extreme contrast, which is maybe just a little overdone. The liner notes imply that a generic fault with this work is that it ‘squanders its exciting diversity of tone in a manner that prefers gesture to argument’. All that said, it is an impressive work, that never loses the listener’s attention. The final piece on this CD is Michael Finnissy’s Second String Quartet dating from 2006-7. This is the most recent work on this disc. It was commissioned by the University of Wolverhampton and the Birmingham Conservatoire and was composed with the Kreutzer Quartet in mind and they gave its premiere. This string quartet is in some ways the most approachable of all the works presented here. The composer has suggested that it is a meditation on Haydn’s achievement in this genre, specifically, the ‘Lark’ Quartet. Whether the Haydn allusions are immediately obvious to the innocent ear is up to the listener to decide. Once again there is a certain flexibility in performance: the parts are not aligned in the score, and the composer has no issues if the music begins to ‘drift slightly apart.’ Finnissy insists that he has explored tonal music in an atonal manner. I found the work listenable and satisfying, without it ever descending into a post-modern idiom. This is pure modernist music at its very best. As noted above, this performance would benefit from watching the playing as well as hearing the music. As the soundtrack stands, I believe that it is a splendid introduction to four masterpieces of 20th/21st century string quartet writing. Everything about this CD is striking. The playing by the UK-based Kreutzer Quartet is stunning, these works could not wish for better advocates, the recording is outstanding, revealing the textures, timbres and effects of these works in an excellent light. The liner notes clarify the music as well as explaining the original ethos of the film. For listeners who enjoy ‘modernist’ music this is an essential purchase; for those who wish to approach this style it is an ideal introduction.